Download the preview to get a FREE verb book! Children love making and reading books! 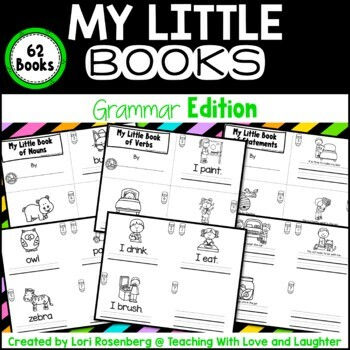 These 64 grammar books are easy to use and so much fun to complete! There are 3 or 4 books for each skill. Preparation is so easy. Just copy each book front to back. The front of the book has dotted lines for the children to use as a guide to cut the book in fourths. The pages are numbered and none of the numbers will be hidden by a staple. Then, just staple and that’s it! Each book has 8 pages, including the cover. 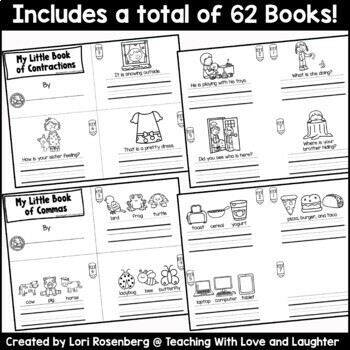 Since there are at least 3 books for each skill, you can introduce one during your whole group, then put one at a center or use it in a small group. You can use one for homework, as an assessment, or for a spiral review, later on. The possibilities are endless! 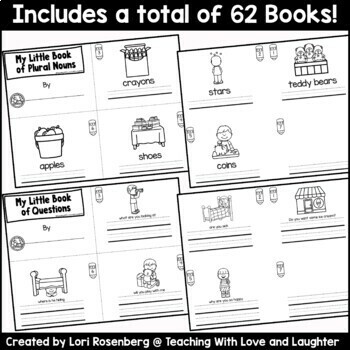 Click here to see the differentiated version with 122 books! Do not purchase both sets! Choose this set if you just want the books with lots of support. 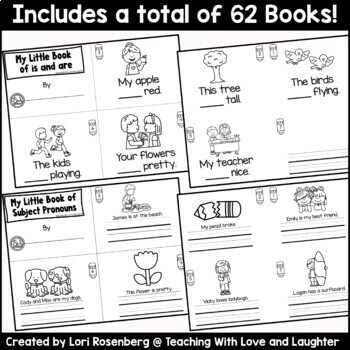 Choose the differentiated edition if you want books with varying amounts of support.